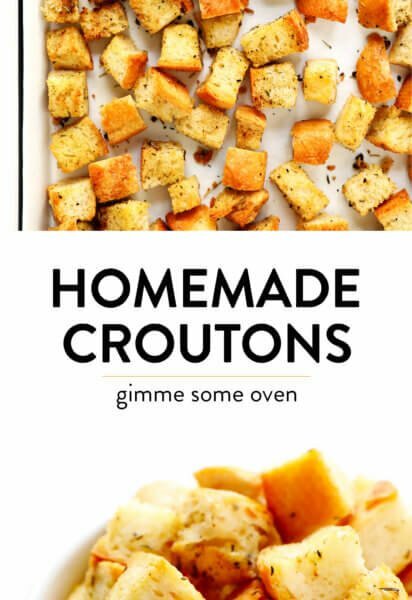 Learn how to make homemade croutons from scratch with this simple, customizable croutons recipe. 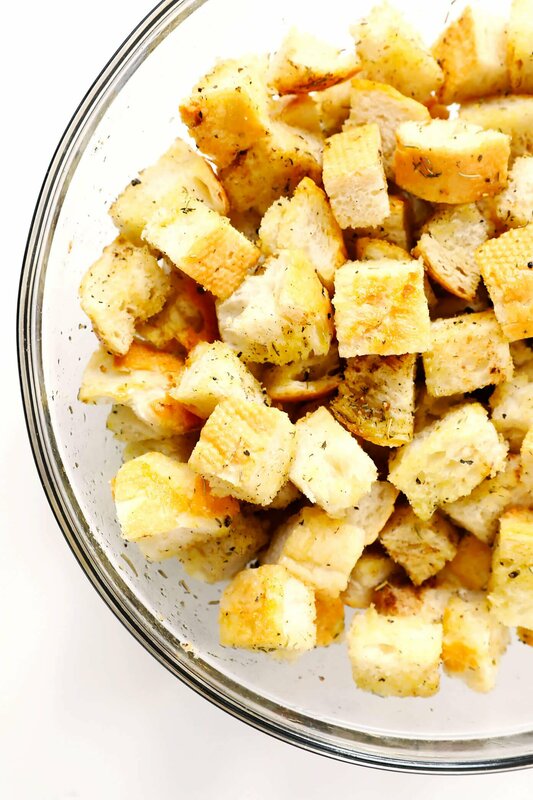 Homemade croutons are just about the easiest thing ever to make, and a million times better than anything you can buy at the store. They’re also easy to customize with whatever seasonings you might be craving, they can be made with any kind of bread that you have on hand (including gluten-free), and they’re easy to make as large or small, soft or crispy, plain or seasoned as you might prefer. Plus, if you’re trying to eat more greens in your life, I’m convinced that having a fresh batch of croutons around is one of the best motivators to toss together a quick salad. Or they’re also delicious for topping a fresh bowl of tomato soup or gazpacho (<– new recipe coming tomorrow, stay tuned!) this time of year. So grab that leftover bread, and let’s bake up a quick batch! Bread: Ideally at least a day or two old, any variety will do. Olive oil: Or melted butter, if you prefer. Seasonings: Totally up to you! 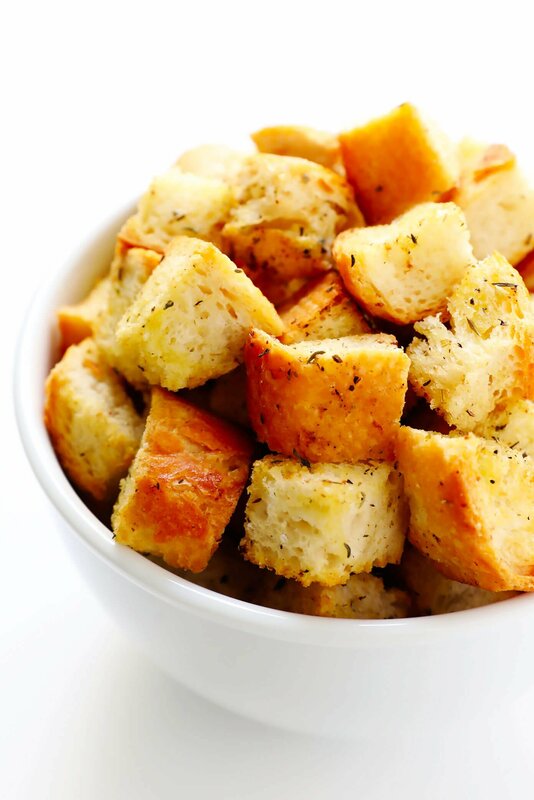 I always, always add garlic powder to my croutons. Plus salt and black pepper. But any other seasonings are up to you! I often turn to Italian seasoning or blackening seasoning, and will occasionally sprinkle on some Parmesan cheese too. Dice your bread: Choose whatever size of cubes you prefer, either cut with a knife or torn into small chunks by hand. It’s just important that the croutons be uniformly sized so that they cook evenly. Toss with oil and seasonings: In a large bowl, drizzle the bread evenly with the oil and seasonings. Then toss until evenly combined. 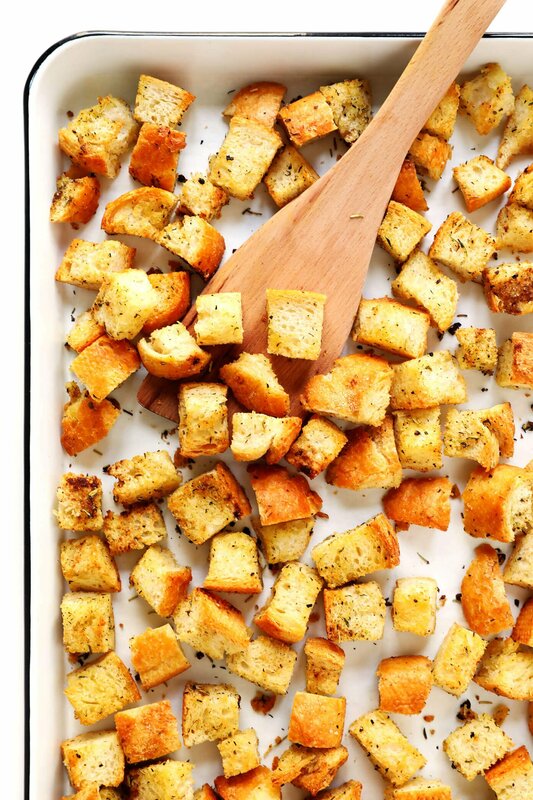 Spread out on a baking sheet: Turn the croutons out onto a parchment-covered baking sheet, and spread out in a single layer. Serve or store: Then serve immediately. 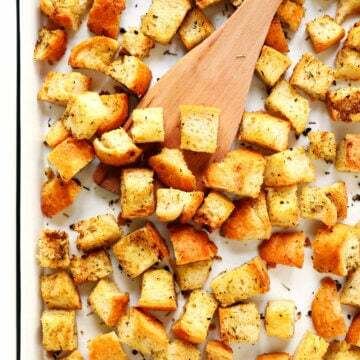 Or let the croutons cool until they reach room temperature, then store in a sealed container for up to 2 weeks. Salads: Especially any kind of Caesar salad, or my favorite Everyday Salad. 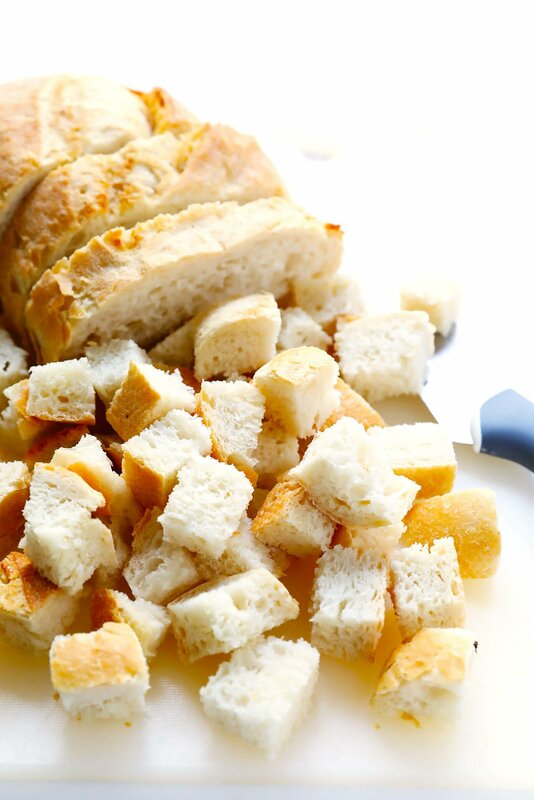 And of course, anytime you need breadcrumbs, just use a rolling pin or food processor to break those croutons up into your preferred size of breadcrumbs. 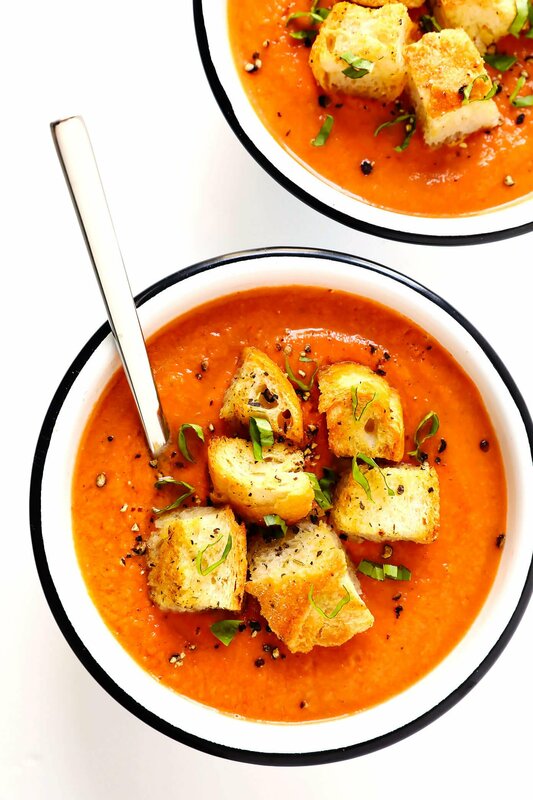 In a large bowl, evenly drizzle the olive oil over the bread chunks. Then evenly sprinkle the Italian seasoning, garlic powder, salt and pepper over the bread. Toss gently until well-combined.